Nearby places include Fisherman’s Village, etc. 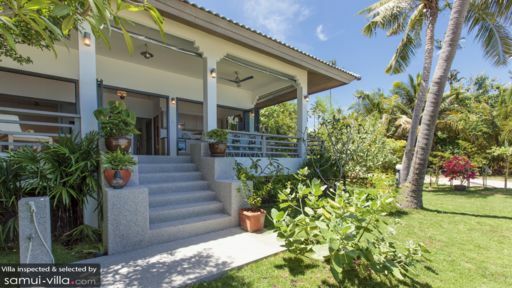 A stunning two-bedroom bungalow located along the north-eastern coastline of Koh Samui, Tradewinds Beach House is a modern home with traces of Thai culture embedded into a more European structure. The main living pavilion opens its doors to verdant gardens dotted with rock boulders and palm trees. Beyond the periphery lies soft, white sands of the pristine Bang Por beach. 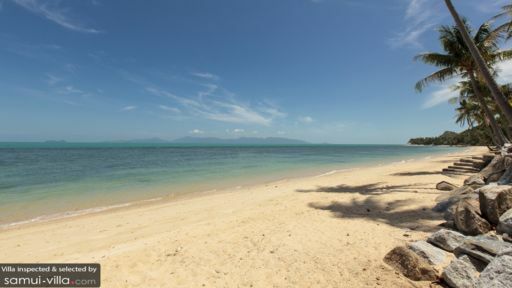 You have all this beach frontage to yourself to indulge in with water sports, tranquil walks, and plenty more. Guests of the villa are free to make use of the amenities at the neighbouring resort, The Sea, with its beachfront pool. There are two, well-furnished, and air-conditioned bedrooms at Tradewinds Beach House; each defined exclusively with its white interiors. The plush king-sized bed in one and twin beds in the other bedrooms stand centre-stage amid polished, elegant, and modern white surroundings. There is ample wardrobe space in the bedrooms along with bedside globe-lighting for an edgy addition. A rustic dresser-drawer, suede-covered chairs, and a large window offering tropical views all form part of the rooms. A bathroom with granite counter vanity, a spacious shower area, and many other modern amenities is available to guests. Tradewinds Beach House is proud to present its luscious, well-kempt, and flourishing gardens with freshly-cut grass collecting the morning dew, blooming flowers exuding a sweet fragrance, and tall trees providing shade from the tropical sun. Enjoy leisurely walks along the beach that may as well be part of the beach house. Take out a kayak or go paddleboarding by requesting the staff to make arrangements. Stone steps lead from the garden to the main veranda at the beach house. The veranda forms part of a huge living space separated only by folding glass doors. 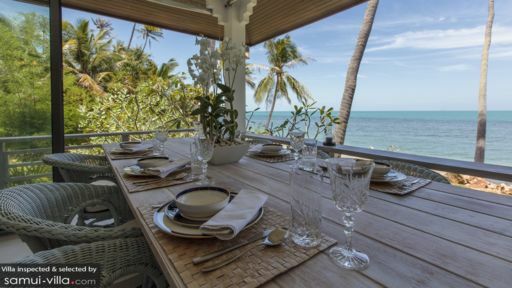 This expansive space has been well-furnished with pleasant wicker furniture, recliner chairs overlooking the sun-streaked sky and glistening ocean, and finally an alfresco dining area for feasts, intimate meals amid romantic surroundings, and evening cocktails while enjoying the sunset. The living room indoors is swathed in all-white interiors from the plush seating to the walls and vaulted ceiling. With a prominent European make, the living room makes for happy memories, time spend watching movies on the flat-screen TV, and utmost relaxation. Besides the dining area outdoors, the main living pavilion comprises a fully-equipped, European kitchen with state of the art appliances, fixtures, and fittings. You can prepare a delicious meal from scratch using locally-sourced ingredients or you can even request the staff to showcase their skills at making fine local delicacies and other international dishes. Welcoming staff helps you settle in and even takes care of the property by cleaning, maintenance, and changing linen. For additional services such as massages, transportation, private chef, etc. you can make a request and the staff is happy to make arrangements. These are charged extra. Surrounded by nothing but gorgeous beach frontage, you have first-hand access to spectacular and spellbinding famed Samui sunsets. Whether you decide to stick to your own garden or head on out to the beach, there is so much you can do without having to travel far. Water activities like snorkelling, surfing, and kayaking are all possible on Bang Por beach. There are many famous spots to visit around the area including the historical Fisherman’s Village and the popular Chaweng.